Free Delivery on Orders Over £60 at Office Shoes Take advantage of free delivery on orders over £60 at Office Shoes. 10% Student Discount at Office Shoes Students, spend to save at Office Shoes thanks to their phenomenal 10% discount across all shoes! 10% Off First Orders with Newsletter Sign-ups at Office Shoes Come and join the family and we'll give you 10% off your first order to help get you started at Office Shoes. 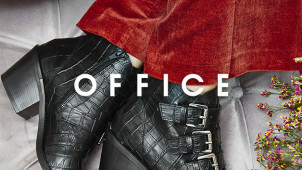 Up to 70% Off Orders in the Sale at Office Shoes Enjoy up to 70% off your orders at Office Shoes. Free Click and Collect on Orders at Office Shoes Do your shopping from the comfort of your own home and collect at your convenience at Office Shoes. Up to 40% Off Selected Vans at Office Shoes Be the man (or woman) with the Vans for less! Enjoy 40% off selected Vans at Office Shoes. Order by 9pm for Next Day Delivery at Office Shoes Fill your basket before 9pm and enjoy a speedy next day delivery at Office Shoes. From the skaters to the corporate city slickers, the sports fanatics to the high-heeled glamour girls; Office Shoes has styles for each and every individual. No matter what fashion tribe you affiliate yourself with, the shoe collection at Office will ensure your shoe-drobe is a fierce fashion statement. Budget cramping your style? With savings from vouchercloud, you can satisfy your urge to splurge on new shoes, without breaking the bank. You’ll find all the top casual footwear brands including Converse, UGG, Adidas, Nike, Toms, Timberland and Dr Martens, as well as designer releases from the studios of Jeffrey Campbell, H by Hudson and Ted Baker. How do I use my Office Shoes promo code? If you want women’s shoes for less than £30, or smart men’s footwear for less than £50, start by checking out the sale section to bag a bargain. Does Office do student discount? If you’re studying at university, don’t forget to rinse your right to student discount online and in-store at Office Shoes. Register or login to UNiDAYS to confirm your student status when you shop online. What time does Office open? Office Shoes opening times vary from day-to-day and the store location, so use the Office Shoes Store Finder to identify your nearest store online, as well as its opening hours. How do I contact Office Shoes customer service? To contact Office Shoes directly regarding their products, placing an order, receiving your order, or anything else, you can contact the customer help team via email, telephone, in writing, or on Twitter. To find an answer to your query straight away, use the help section on the website here. Choose from a range of topics to help you with your order, including delivery and returns queries, size guides, terms and conditions, paying for your order and tracking your order. Choose from the options below to help answer your queries. The customer services opening times are 9am - 6pm Monday to Friday and 9:30am - 4:30pm on Saturdays. Standard Delivery is Free on Full Priced Items (£3.50 otherwise) - takes 3-5 working days. Next Working Day Delivery is £5 - order by 9pm. Saturday and Sunday Delivery are £6 and £7 - order by 5pm Friday. Items can be returned via CollectPlus for £2.50, or for free in-store (both within 28 days of delivery). Simply affix your CollectPlus label to your parcel in its original packaging (if yours has gone missing you can print one here) and return to your nearest CollectPlus store. Keeping British feet in fashionable footwear since the 1980’s, Office Shoes are always ahead of the fashion pack. Their shelves are gleaming with a handpicked selection of top footwear brands and on-trend own brand styles to suit every occasion. If your shoe addiction struggle is real, shop with an Office Shoes discount code to save on summer brogues, black office shoes, flip-flops, trainers, ankle boots and all the rest! With favourite brands like New Balance, Converse, Nike and many more to choose from - you're sure to stay ahead of the fashion game with Office. Office Shoes' reputation for stylish footwear means you can regularly shop for exclusive styles from footwear brand favourites such as Converse, Nike, Adidas, Puma and more. Follow Office Shoes on Facebook and Twitter to be first to know when exclusives drop online and in-store, and grab the kicks that everyone's after first! Upgrade your wardrobe this summer with the Office boots that mean business! This season you'll find new Chelsea boots in rich colours from Dr. Martens, alongside suede numbers from the Office brand, new UGG boot designs and much more. Men and women alike can revel in summer styles for less with an Office promo code to save on quality additions to your shoe collection. Whether you want walking boots from Timberland or boots with sass for date night, you'll find your feet with Office!